We are slightly obsessed with modern farmhouse décor at the moment. Rustic. Warm. Simple. Yes, please! 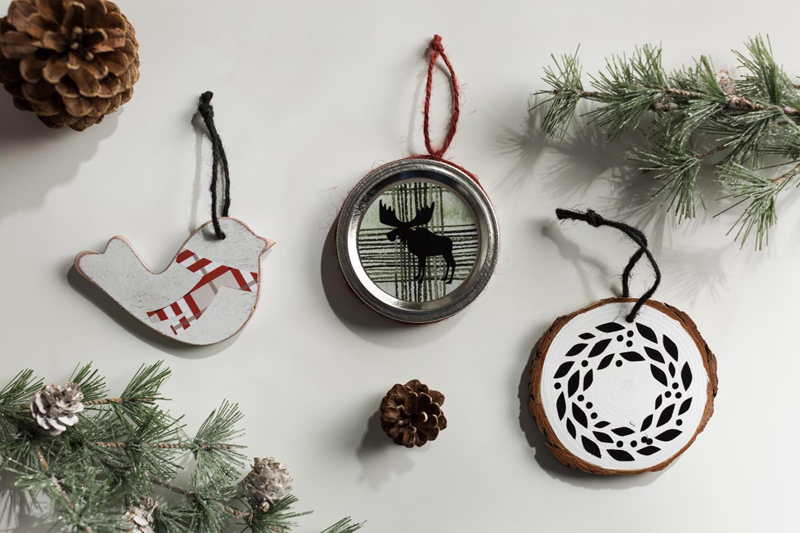 This holiday season we brought this aesthetic to life making all of our projects using the versatile Cricut Maker™. This blog takes you on a tour of many of the many projects we created. Read on and let us know in the comments section which of these projects would be perfect to make for your living room. Let’s start with projects on-and-around the Christmas tree. 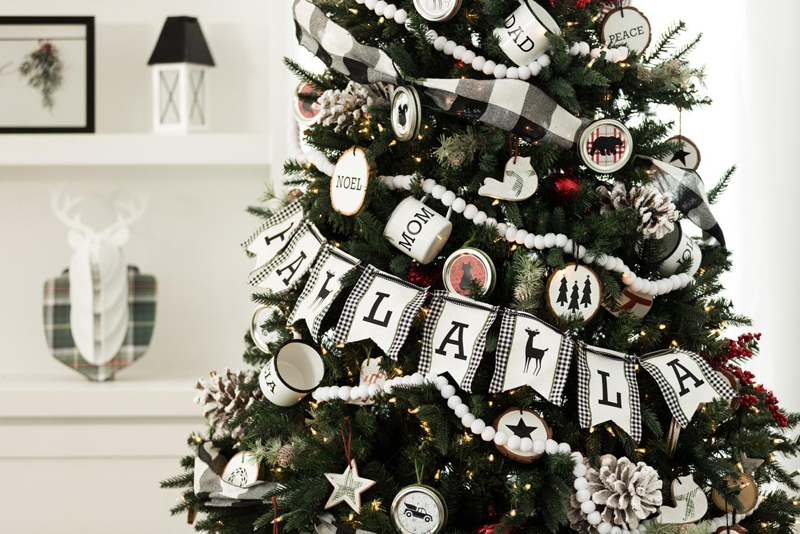 We love this fun checker-patterned banner that drapes gently across your Christmas tree to provide the perfect finishing touch. 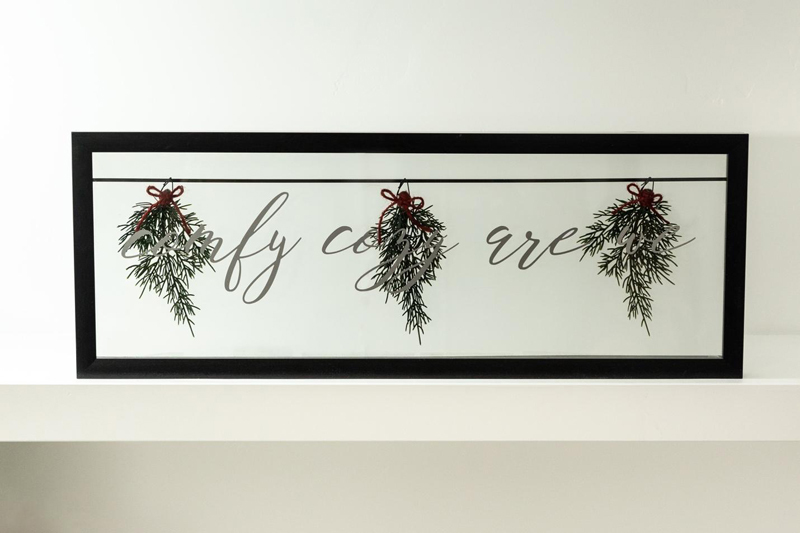 We designed two deer panels that break up the “Fa La La” but you can certainly customize your banner with other farmhouse themes or phrases. We used the EasyPress 2 and Everyday Iron-On™ to heat transfer the letters and deer onto the fabric panels. Stitch panels together and run ribbon through the grommet corners to finish off the banner. Then, step back and enjoy! Crafting Christmas tree ornaments continues to be one of our favorites. I think it has to do with the sentimental value they bring year-after-year. Also, using different materials to create a textured and customized design keeps me every year wanting to make, make, make…This year, we designed several ornaments, each using different materials and craft techniques. Be sure to check them out in Design Space and tell us below in the comments section which one you like best! Here is an adorable and easy project perfect for newbies to Cricut. 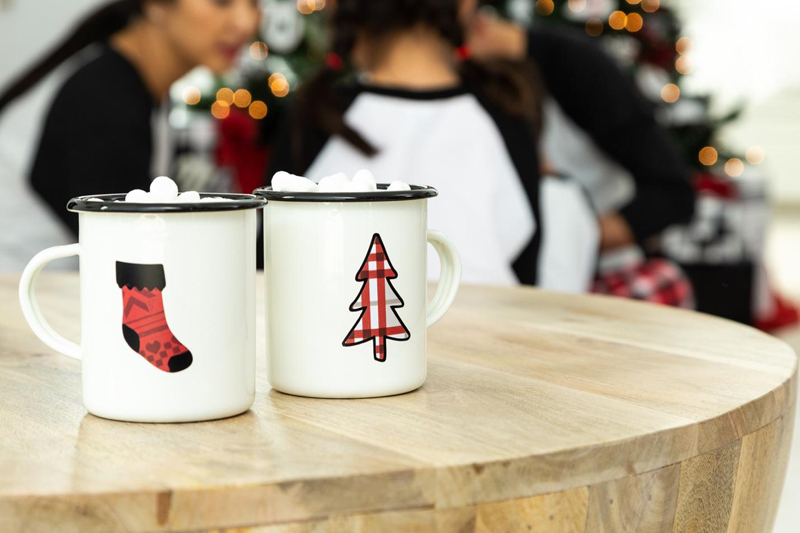 You only need a Cricut Maker or Explore to cut vinyl and then apply to white blank mugs to spice them up! That is it! The really cute vinyl patterns we used are from the Cricut Premium Vinyl Nordic Christmas Sampler. Who loves gift wrapping? Me! Me! Me! These adorable Farmhouse Style Gift Tags are one of several different gift wrap projects we designed this season (be sure to also check out the Acorn Stamp Gift Wrap and Comfort & Joy' Gift Wrap). 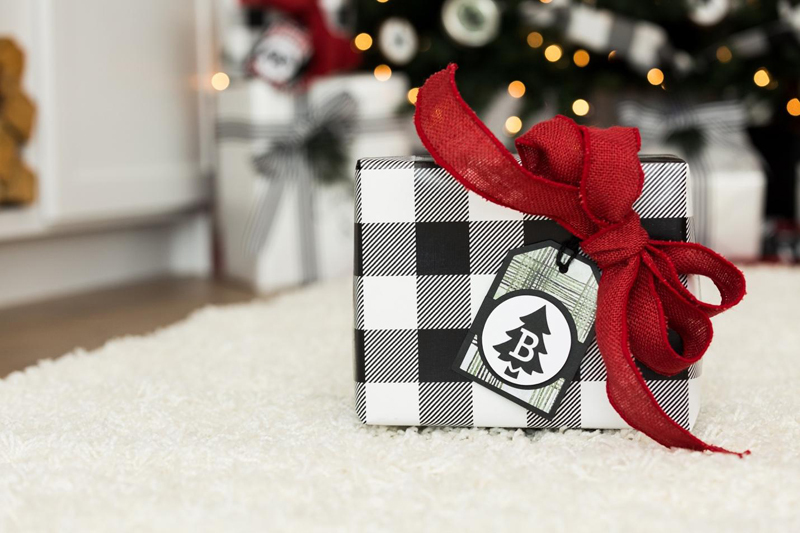 For the Farmhouse Style Gift Tags, there are actually two projects in one (one uses a Christmas tree image (like pictured above) and a second alternative design uses a bear image). And, do not forget that there is no end to the countless images you could choose from in Design Space (we have over 50,000 images!). This stocking and matching monogram ornament go together perfectly like Santa and cookies! The monogram letter can be customized in Design Space to your choice. The Knife Blade cuts the basswood with precision to make the monogram. Add a stroke or two of white paint and tie off with black ribbon to finish. This project is for all you paper crafters out there! This relatively easy project uses the Scoring Wheel to make crisp score lines needed to fold the houses with ease. 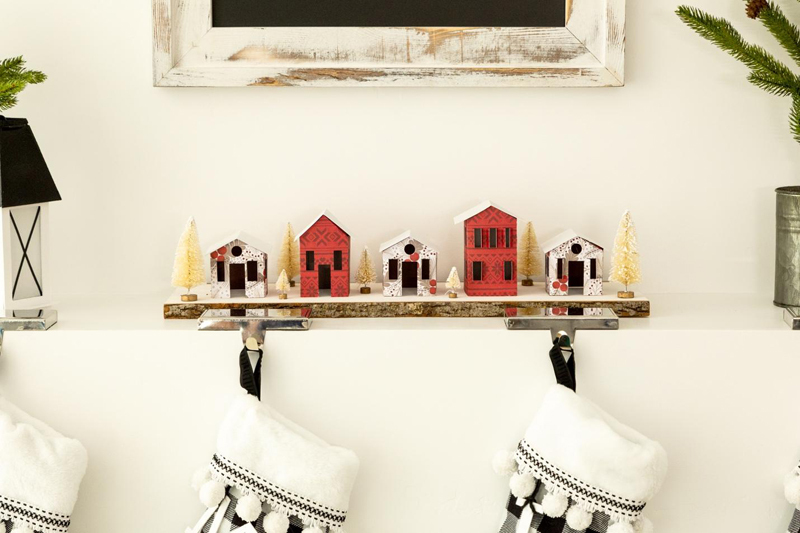 We used colorful Deluxe Paper, Nordic Christmas and Glitter Cardstock to bring great pops of color to the mantle. Once you have cut, scored and glued one of the houses, the rest of the village should come together with ease. Count down the 12 days of Christmas with this set of fun boxes that are perfect for hiding treats and small gifts. 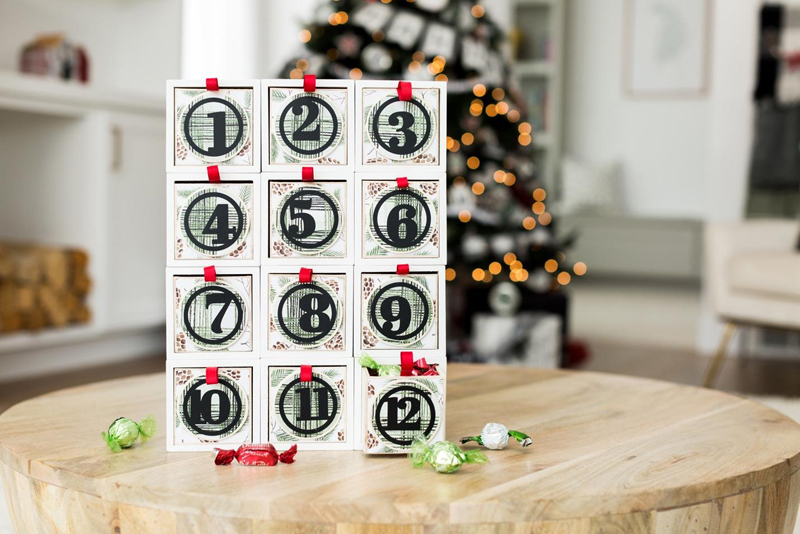 Pick up from your local craft store twelve boxes with drawers and then head over to your craft room to embellish with circular count-down labels. We used one of our favorite materials–Premium Vinyl™ Patterned Sampler, Winter Wonderland. Here is another elegant and relatively easy project perfect for crafters looking for a vinyl-on-glass project. This sign uses transparent glass and natural evergreen accents for a beautiful textural combination. Simply cut out some Premium Vinyl and use Transfer Tape and Scraper Tool to apply to glass. Use red twine to tie and hang evergreen sprigs to the back of the clear frame. A huge pop of color highlights this fun no-sew fabric project. 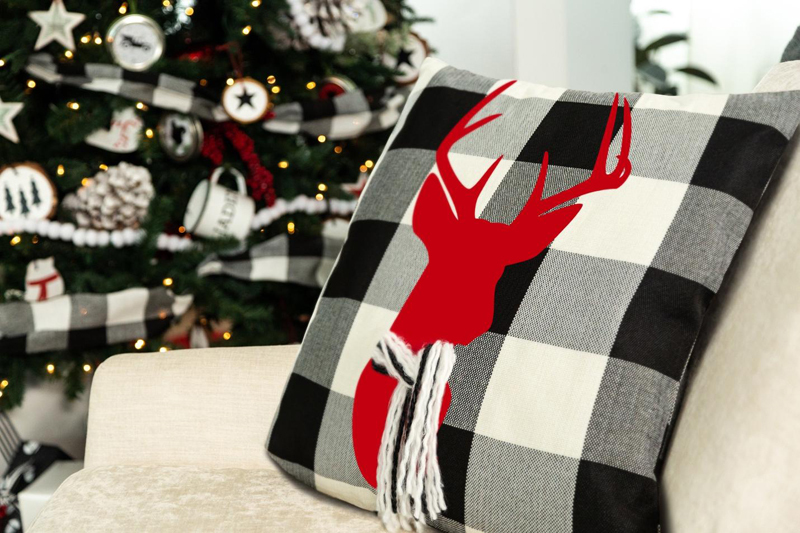 Easily apply a stunning deer head silhouette onto a checker-patterned throw pillow using a 12” x 10” EasyPress 2 and red Everyday Iron-On. Once the iron-on is transferred to the pillow, use a large needle to thread lengths of yarn through the pillow cover and leave both ends hanging long. Repeat until there are two hanks of yarn on either side of the deer's neck. Then, tie them like a scarf. We loved pulling these projects together and hope you came away with a few holiday craft ideas. In the coming weeks, keep an eye out for more blogs and tutorials on more projects from our holiday scene. Also, be sure to see our Gift Guides and 8 Weeks to DIY Your Holiday blogs for additional inspiration.